WASHINGTON (AP) — Cities in the United States and Western Europe are being eyed as Islamic State militants’ future targets and President Barack Obama needs to take action, U.S. lawmakers say. Without offering specifics on any threats or suggestions on how to confront them, the leaders of the Senate and House intelligence committees on Sunday prodded the White House to work to prevent the Islamic State extremists from launching attacks on U.S. soil. The bipartisan pair of lawmakers shared a dire warning about the Islamic State group, which now has control of vast swaths of Syria and Iraq, has killed civilians from that region and beheaded American journalist James Foley. In a separate TV interview, the leader of the House Intelligence Committee warned the leaders of the Islamic State, sometimes called ISIL or ISIS, are looking for a spectacular attack that would help them raise money and recruit more fighters. 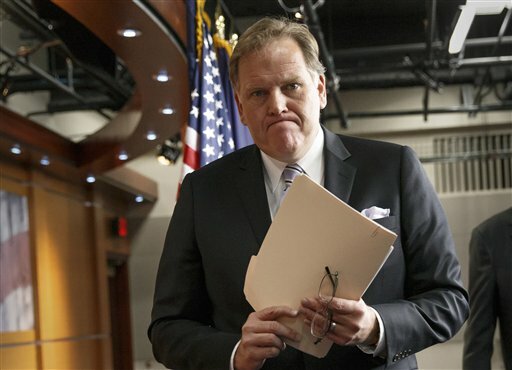 “ISIL would like to have a Western-style attack to continue this notion that they are the leading jihadist group in the world,” said Rep. Mike Rogers, R-Mich. The pair of lawmakers, who have access to some of the nation’s most sensitive secrets and receive regular detailed briefings from the nation’s spy agencies, offered dire predictions of an attack on the United States or its European allies if the militants are not confronted. The threat, Rogers said, could include Americans who have trained with Islamic State fighters. He said there are hundreds of Islamic State-trained Americans who can return to the U.S. with their American passports. “I’m very concerned because we don’t know every single person that has an American passport that has gone and trained and learned how to fight,” Rogers said. Rogers said U.S. intelligence agencies were tracking the Americans who are known to have traveled to the region. If they helped Islamic State fighters, he said, they should be charged under laws that prohibit Americans from aiding terrorists. The top Democrat on Roger’s intelligence panel, Rep. C.A. Dutch Ruppersberger of Maryland, was more skeptical. He said more needs to be known before judging whether Islamic State extremists plan to commit terrorist acts in the U.S. any time soon. The group’s priority now seems to be to hold on to territory it has gained rather than export violence. “It is extremely urgent, but you don’t just rush in,” he said.